One of the most popular topics I’ve written about over the past 10 years, and the one I get the most email on, is the ins and outs of using the Medicare Advance Beneficiary Notice of Noncoverage – the ABN – also known as form CMS-R-131. Why is getting an ABN so important? The answer to this question is simple. If you supply a service to a Medicare patient and Medicare does not pay for it, you can only collect payment from the patient if you’ve communicated to the patient what the cost is and that the cost will be their responsibility AND the patient has agreed. If you routinely supply services to patients that Medicare does not cover and do not use the ABN, your practice will be missing income that is rightfully yours. Read on for more information on the appropriate times to issue ABNs for Medicare (and non-Medicare patients). Why do practices find it difficult to use ABNs? The ABN is a collection tool that many medical practices do not know how to implement. 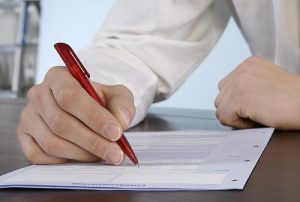 It is particularly difficult to determine who has ownership of this process, because the form must be completed and signed by the patient before the service is provided. The patient is in the exam room or the lab, ready for the service or test, and a knowledgeable staff person must step in, explain the rules and pricing and obtain the patient’s signature. Which insurance plans require the ABN? Although you can use the ABN for Medicare Advantage Plans (commercial insurance plans that offer Medicare replacement coverage) only original/traditional Medicare (sometimes referred to as the “red, white and blue card” Medicare) REQUIRES the ABN. Commercial non-Medicare plans have also started asking physicians to issue ABNs when a service will not be covered by the plan and the patient will be paying for the service out-of-pocket. I’ve developed a non-Medicare ABN that you are welcome to have a copy of – just drop me an email (marypat@managemypractice.com) and request it. I think ABNs are not a bad idea at all to give to non-Medicare patients as it formalizes the process and drives home to the patient what the cost for something they ask for will be and that they’ve agreed to pay for it. Please don’t use a blanket ABN in place of a solid financial policy. Your financial policy should state that patients agree to be responsible for payments for services their plans don’t cover. The ABN is meant for specific individual services or series of services that the insurance plan is not going to cover, not as a catch-all for whatever insurance does not pay for. Note that the ABN is not meant to cover any dollars for which you are contractually obligated to write-off. What version of the ABN is current? As of last summer (6/21/2017), there is an updated ABN. You should be using the one that has the date of 03/2020 in the lower left-hand corner. In accordance with Section 504 of the Rehabilitation Act of 1973 (Section 504), the form has been revised to include language informing beneficiaries of their rights to CMS nondiscrimination practices and how to request the ABN in an alternative format if needed. Copies of the current ABN are available in English and Spanish here. The ABN is to be used by all providers, practitioners, and suppliers paid under Medicare Part B, as well as hospice providers and religious non-medical healthcare institutions (RNHCIs) paid exclusively under Medicare Part A. Since 2013, home health agencies (HHAs) providing care under Part A or Part B issue the ABN instead of the Home Health Advance Beneficiary Notice (HHABN) Option Box 1 to inform beneficiaries of potential liability. The HHABN has been discontinued. When should the ABN be used? The ABN’s purpose is to allow the physician practice to collect from the patient for services that the patient wants but are not covered by Medicare. Practices are not expected to give ABNs to patients to cover services that are never covered (called statutory exclusions), however, many practices find that supplying this form to patients helps patients understand why they are responsible for the paying for the service. Practices may collect in full at time of service for services that are never covered by Medicare, but if you are not sure if Medicare will or will not pay, you may want to wait for Medicare to adjudicate the claim before collecting from the patient. Note that the ABN must be completed and signed BEFORE providing the items or services that are the subject of the notice. Also note when the ABN is used as a voluntary notice (i.e. for statutory services), the beneficiary is not required to choose an option box or sign the notice. The brochure that describes in-depth of what Medicare does not cover is available here. Can you give an example of when to use an ABN? A Medicare patient wants an EKG even though she does not have any symptoms or diagnoses that would point to an EKG being medically necessary. She is not in her first 12 months of Medicare coverage, therefore she does not qualify for an EKG as a part of her Welcome to Medicare Visit (not an exam.) She believes there may be something wrong with her heart, even though she cannot name any symptoms that would warrant a diagnostic EKG. In this case, without a diagnosis to support the EKG, an ABN would be appropriate. You would advise the patient that Medicare may not pay for the EKG, in fact probably won’t pay for the EKG, and you complete the ABN, showing the patient what she will be paying out of pocket for the test. In the case of Medicare not covering the test, you may charge the patient your full rate for an EKG and are not restricted by the Medicare allowable. If the patient agrees to have the test and signs the ABN stating she understands she will be responsible for the cost of the test if Medicare does not pay, you will provide the patient with a copy of the signed form and will will attach the completed form to the patient’s encounter form or somehow note in the EMR that an ABN has been obtained so the EKG will be billed with the modifier “GA” which indicates an ABN was executed for a service that might not be covered by Medicare. In the case where a service is never covered (i.e. statutory exclusions) you may append a modifier “GY” to the service to indicate an ABN is on file. The ABN can be scanned with the encounter form or any other financial paperwork from the visit so it can be retrieved if requested by Medicare during an audit. If you do not archive your paperwork electronically, you can file the ABNs alphabetically by patient name by month. You can also scan the ABN into your EMR if you choose. What are statutory exclusions (services that are never covered) under Part B? Oral drugs and medicines from either a physician or a pharmacy. Exceptions: oral cancer drugs, oral antiemetic cancer drugs and inhalation solutions. Routine eyeglasses, eye examinations, and refractions for prescribing, fitting, or changing eye glasses. Exceptions: post cataract surgery. Refer to benefits under DME prosthetic category. Hearing aids and hearing evaluations for prescribing, fitting, or changing hearing aids. Routine dental services, including dentures. Routine foot care without evidence of a systemic condition. Injections which can be self-administered. Exceptions: EPO, and clotting factors. Nursing care on a full-time basis in the home and private duty nursing. (Refer to benefits under Medicare Part A). Services performed by immediate relatives or members of the household. Services payable under another government program. Services for which neither the patient nor another party on his or her behalf has a legal obligation to pay. Immunizations. Exceptions: Influenza, Pneumovax and Hepatitis B. “Annual Physicals” best described by codes 99387 or 99397. This is a long discussion for another post, but note that Medicare does not pay for annual preventive EXAMINATIONS, although they pay for annual wellness visits, which are not physical examinations. They do, however, pay for screening pelvic and breast exams and pap test collection at specific intervals. How do you complete the “Estimated Cost” Section F of the ABN? What about estimating the costs for a series of services? Multiple items or services that are routinely grouped can be bundled into a single cost estimate. For example, a single cost estimate can be given for a group of laboratory tests, such as a basic metabolic panel (BMP). An average daily cost estimate is also permissible for long term or complex projections. As noted above, providers may also pre-print a menu of items or services in the column under Blank (D) and include a cost estimate alongside each item or service. If a situation involves the possibility of additional tests or procedures (such as in laboratory reflex testing), and the costs associated with such tests cannot be reasonably estimated by the notifier at the time of ABN delivery, the notifier may enter the initial cost estimate and indicate the possibility of further testing. Finally, if for some reason the notifier is unable to provide a good faith estimate of projected costs at the time of ABN delivery, the notifier may indicate in the cost estimate area that no cost estimate is available. We would not expect either of these last two scenarios to be routine or frequent practices,but the beneficiary would have the option of signing the ABN and accepting liability in these situations. How do I use modifiers to indicate the ABN is present? The modifiers can be confusing! Focus on using the GA and GX modifiers as best practice. Use this modifier to report that an advance written notice was provided to the beneficiary of the likelihood of denial of service as being not reasonable and necessary under Medicare guidelines. Report when you issue a mandatory ABN for service as required and is on file. You do not need to submit a copy of the ABN but it must be available upon request. The most common example of these situations would be services adjudicated under a Local Coverage Decision (LCD). The presence or absence of this modifier does not influence Medicare’s determination for payment. Line item is submitted as covered and Medicare will make the determination for payment. It is inappropriate to use the GA modifier when the provider/supplier has no expectation that an item or service will be denied. Do not use on a routine basis for all services performed by a provider/supplier. Use this modifier to report when you issue a voluntary ABN for a service that Medicare never covers because it is statutorily excluded or is not a Medicare benefit. Line items submitted as non-covered will be denied as beneficiary liable. You may use this modifier in combination with the GY modifier. Use this modifier to report that Medicare statutorily excludes the item or service or the item or service does not meet the definition of any Medicare benefit. Use this modifier to notify Medicare that you know this service is excluded. Services provided under statutory exclusion from the Medicare Program; the claim would deny whether or not the modifier is present on the claim. It is not necessary to provide the patient with an ABN for these situations. Situations excluded based on a section of the Social Security Act. Modifier GY will cause the claim to deny with the patient liable for the charges. Do not use on bundled procedure or on add-on codes. You may use this modifier in combination with the GX modifier. Use this modifier to report when you expect Medicare to deny payment of the item or service due to a lack of medical necessity and no ABN was issued. This modifier is an informational modifier only. Medicare will adjudicate the service just like any other claim. If Medicare determines that the service is not payable, denial is under “medical necessity.” The denial message will indicate that the patient is not responsible for payment. If either the beneficiary or provider requests a review, the modifier tells us an ABN was not given, and this could help in completing the review quickly. Medicare will auto-deny services submitted with a GZ modifier. The denial message indicates that the patient is not responsible for payment; deny provider liable. If either beneficiary or provider requests a review, the modifier tells us that an ABN was not given. For in-depth instruction from Medicare on completing the ABN, click here.